CAMPINAS: Cristiano Ronaldo trained at near full capacity Saturday but was noticeably protective of his recovering left knee, two days ahead of Portugal's World Cup opener against Germany. The star striker took a full part in warm-ups in front of the watching media but he was careful not to put his full weight on the strapped knee as the squad went through some jumping drills. All eyes have been on Ronaldo's recovery from thigh and knee problems despite his return to play 65 minutes of Portugal's final warm-up game against Ireland this week. The Real Madrid forward, whose form and fitness will be vital to Portugal's chances, sparked fears of a recurrence of the knee problem when he had it iced after training on Thursday. 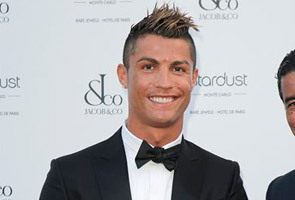 On Friday, up-and-coming midfielder William Carvalho gave assurances that Ronaldo was "now 100 percent fit". Monday's Group G clash in Salvador is a re-run of Portugal's Euro 2012 opener against Germany, when they went down 1-0 to a second-half Mario Gomez goal.